Motivational Speaker. Author. Inspirational Ventriloquist. Expert on Happiness & Success! GET HAPPY – AVAILABLE NOW! It’s time to stop living an average life! Move from defense to offense, from hoping things happen to you, to making things happen for you! This book has the WOW factor! It’s 240 pages of power-packed inspirational insight that will take you from where you are to where you want to go. Invest in yourself. If you want to live the life of your dreams, then NOW is your time! Marc Griffiths is the World’s #1 Inspirational Ventriloquist. He is a speaker, author and expert on happiness and making dreams come true! He helps businesses, organizations and schools get such amazing results that they can’t stop laughing! Would you like a more profitable business, a successful event, motivated employees or a happier atmosphere? Push the big red button to book a visit or click here to learn more. The best corporate talk we’ve had—certainly the most fun!’ Entertaining and engaging, our business leaders were inspired! When Marc spoke, the venue manager laughed so much she had tears running down her face and had to reach for her asthma pump! I would highly recommend Marc for his professionalism and likability on and off the stage. Do you want to have an amazing relationship? Make more money? Lose weight? Be free from addiction? Make your dreams come true? In his talks and books, Marc gives keys to unlock these areas and ultimately get his audiences what they really want. Check out Marc’s videos, blog and happy twitters! TAKE THE HAPPY TEST NOW! Marc is based in the US but tours and speaks internationally. Are you ready to discover the BEST life you can live? Want to avoid the number one most costly mistake? Do you want to know the secret to getting what you WANT, learn how to solve GIANT problems and discover the proven formula to making YOUR dreams come true? This book moves you from defense to offense, from hoping things happen to you, to making things happen for you! This book has the WOW factor! The extra fun edge that says it as it is! It’s 240 pages of power-packed inspirational insight that will take you from where you are to where you want to go. If you want to live the life of your dreams, then NOW is your time! Get your people successful! Why have AVERAGE when you can have OUTSTANDING success? You do that from the inside out, by getting the workforce happy and successful. According to Gallop, 87% of employees are either filled with resentment towards managers, have an inflated sense of entitlement or operate at levels of incompetence that border on astounding. The average company either retains one worker in every 7 hires, or wastes huge amounts of money going through a lot of people to find a few good ones. Marc Griffiths is passionate about helping businesses and employees get happy and successful. He does this by bringing laughter to open the audience up, before educating them about themselves, giving them new self-motivating purpose. 80% of people’s problems solved! This talk is flexible and is built to the clients needs. It’s inspirational and packed with humor, enabling the audience to laugh, enjoy and accept the content. Delivered by Marc Griffiths, motivational speaker, inspirational ventriloquist, author and happiness expert. You don’t need another average talk – you need an OUTSTANDING one! It’s time to live with new purpose! Purpose pulls people forwards. People with no purpose go backwards. Real motivation doesn’t come through hype. It comes when you access people’s dreams and heart desires. That’s their real motivation, which when harnessed, is the most powerful motivating force there is. It’s time to get everyone motivated with new purpose! The audience to have a great time! This talk has had great results. It’s hugely popular and audiences come out super energized! Why? Because it leverages people’s true inner passions and purpose. 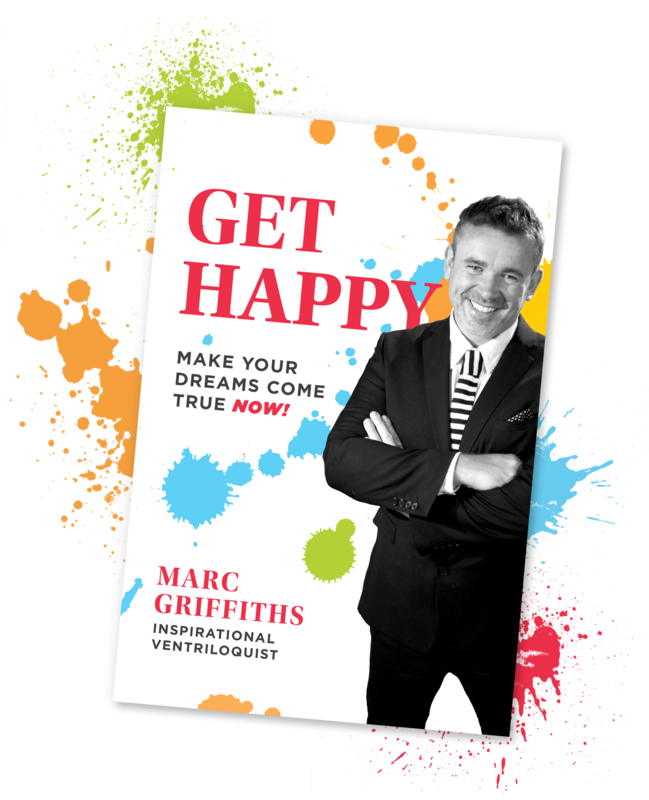 Let Marc Griffiths, motivational speaker, inspirational ventriloquist, author and happiness expert, fill your people with new purpose and they will get you all the results you want and will do all the motivating themselves! Yes, the glass is always full! I’m a very happy person! Are you good at forgiving and overcoming disappointment? Are you happier than your friends? Does your happiness depends on your circumstances? How happy do you think you are? Are you health conscious, exercising and eating well? Are you spiritually aware and regularly attending a communal group? How happy are you financially? Do you have a great relationship with your parents? Do you have a strong sense of purpose? Would you like to receive ongoing updates from us? Would you like to receive ongoing happy email updates from us?